SAN JOSÉ, CA -- Like in a glittering diamond, Mexico has many facets. If one focuses on a facet of its past (1345 BC) one could see the wondering Aztecs searching for the site where they will find an enormous eagle devouring a serpent standing on a cactus. As professed by their “seers,” that would be the place where they must found their city,Tenochtitlan. That the Aztecs actually saw what was foretold to them on the Western shore of Lake Texcoco, did not discourage them at all. They founded Mexico in that site, which they believed was the center of the world, because all the waters of the rivers and lakes merged there. So, for them, it was a Sacred place, where all the gods were going to be born. In another facet from its past (1525 A.C) We see Mexico as a territory belonging to Spain, from which it inherited it language (Spanish) and its Catholic religion. In another facet, the Mexico of the later years (l864) is now a precinct of the Empire of Maximiliano de Austria. And as the decades, continue chiseling new facets in the diamond that is Mexico, we see in them people from all over the world living in Mexico, raising its level of culture, teaching it new forms in architecture, enriching, its language, its music and its arts. 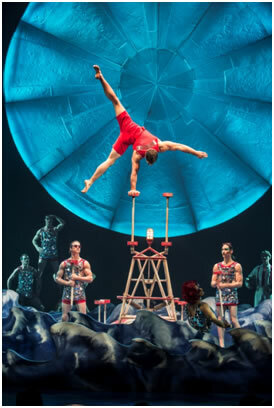 LUZIA is the story of the "magic land" where plane pilot FOOL KOLLER (the clown) descends from the sky holding and umbrella after losing control of his plane, landing near a round garden of Marigold flowers watered by two small robots whose heads are upside-down sprinkling pots. The land is magical in its sights. Each one an allegory representing a different aspect of the culture of Mexico. And the land has a musical voice, that we hear in the marvelous singing voice of Mexican singer MAJO CORNEJO (pictured left) who in her songs, represent the spirit of Mexico, in melodies of different genders, played under the Direction of Musical Director/Composer SIMON CARPENTIER. There are many sounds and they are created in guitars, violins, trumpets, piano, marimbas and accordions in many others mixed with the sounds of wind, and falling water. The show begins in the darkness of the circus carpa, with the sound of the motor of the out-of-control plane flying over our heads. We can hear the plane, and we can see the pilot descending on the stage. As he looks around. The first thing our “pilot” (KOLLER) sees is a little girl running followed by a huge butterfly, chased by an even bigger silver horse. (Shown on our first photograph). These are our first allegories representing the Mexican spirit of speed. The running girl, like the Tarahumara Indians, an Indian tribe where its Indians, who are flat-footed, can run bare footed for hundredths of kilometers non stop, represents here the group of Mexican Indians who also can run long distances wearing huaraches. The horse, el caballo (horse in Spanish) represents the speed of Mexico City, and an important part of the Mexican history. The horses, still used daily by the "Rancheros" were introduced by the Spaniards to Mexico during the Conquista (1525 AC) and later on adopted by the farmer (rancheros) population. The butterfly, represents the famous Monarcas, that as we all know are butterflies that every year travel 5000 kilometers from southern Canada to Mexico where they hibernate for the winter with only those born in the late Summer taking the long route of migration. In creating the colorful costumes in the show GIOVANNA BUZZI was inspired by the traditional embroidery techniques of the Otomi people. EUGENIO CABALLERO’s creative scenography, show us the topography of a country with deserts and jungles, mountains, lakes, volcanos and marvelous sunsets. transporting us, visually, to different places in this magic land. The best one, stretching his body on the air (see picture above. ) supported on his right hand. With a wealth of talented directors, film maker, world-known stars like ARTURO DE CORDOVA, HERMANOS SOLER, MARIA FELIX, SARA GARCIA, PEDR ARMENDARIZ, singers like JORGE NEGRETE, y PEDRO INFANTE y comedians like TIN TAN y CANTINFLAS the Mexican films, shinned like a star through the Hispanic-speaking countries for years. 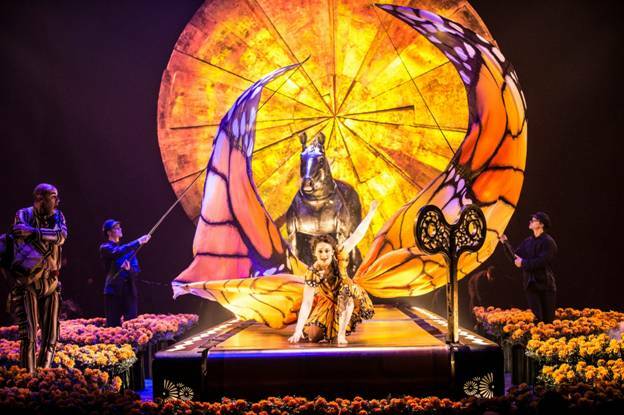 Every one of the acts on LUZIA is extraordinary. Some of them very difficult to perform, most of them, need to be seen to be believed. Reminding us of the AZTEC culture is TLACOPAN, another act performed in Chinese poles. In this act, the athletes, men and women, climb the metal tall poles using their bare feet and hands and execute in them a series of exercises, some of them to remind us of the dances of the dead that were called by the god TLALOC to dance in an exquisite tropical garden. We could add that the garden in LUZIA also has rain, and that the rain is represented by a huge waterfall of water falling on the stage. 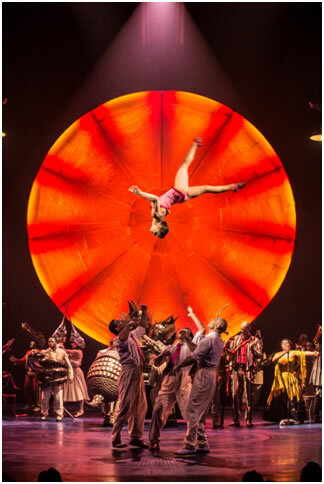 Each actor in LUZIA is a star. Each act of the show, wonderful. We are unable to describe them all because of space, but we will describe the one that shows the most unbelievable dexterity in in a man. Its performer is Russian contortionist ALEKSEI GOLOBORODKO, who makes us wonder with his different contortions if his body has no bones. The shapes his body takes, have a story. The program says that after failing ill, artisan PEDRO LINARES dreamt that he was staying in a forest where the trees, clouds, rocks and animals morphed into hybrid creatures. 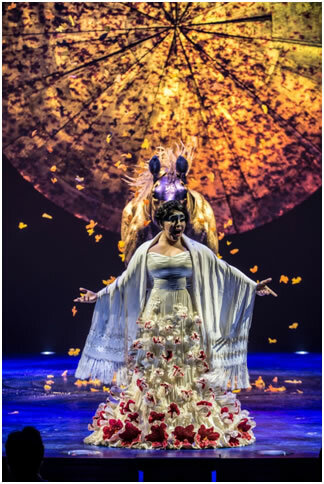 And being a show about Mexico, LUZIA ends it with a fiesta with food, music, and singing to remind the audience that the spirit of Mexico is music, friendship, hospitality. 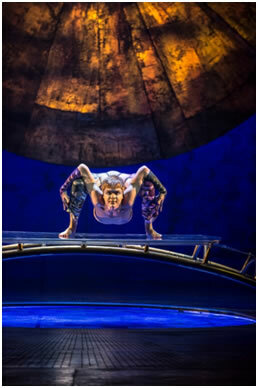 In LUZIA , one of their most creative spectacles, CIRQUE DU SOLEIL, presents to the audience a positive aspect of Mexico, its history, its culture, and its people, who like all the actors in the CIRQUE DU SOLEIL spectacle, show the world, every day, that they can do the impossible.